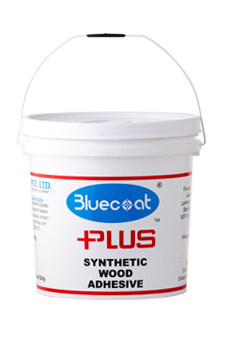 Bluecoat Plus is widely used for all Types of Wood, Cold Press/Hot Press and Post forming applications. For bonding Plywood/MDF/Particle board etc with each other & also bonding with Laminate/Veneer etc. For Edge Bonding, Finger Jointing and Wooden Flooring where water seepage is not present. Powerful Bond strength. Suitable for Vertical/ Horizontal applications. Excellent spreadability for better coverage. Non Hazardous / non flammable and free from harmful solvents. "Zero Wastage Pack" - New International bucket packing with an in¬built small lead on the main cap for minimum wastage, free from dust, grease, any foreign particle and for minimum skin formation. 1 Year from date of Mfg., under recommended storage conditions & in sealed container.